Basketball is a sport, generally played by two teams of five players on a rectangular court. 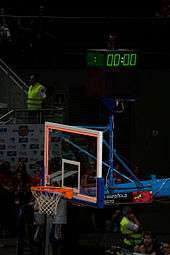 The objective is to shoot a ball through a hoop 18 inches (46 cm) in diameter and mounted at a height of 10 feet (3.048 m) to backboards at each end of the court. The game was invented by Dr. James Naismith, who would be the first basketball coach of the Kansas Jayhawks, one of the most successful programs in the game's history. 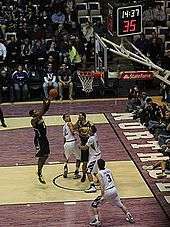 A team can score a field goal by shooting the ball through the basket being defended by the opposition team during regular play. A field goal scores three points for the shooting team if the player shoots from behind the three-point line, and two points if shot from in front of the line. 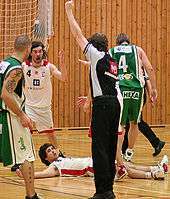 A team can also score via free throws, which are worth one point, after the other team is assessed with certain fouls. The team with the most points at the end of the game wins, but additional time (overtime) is issued when the score is tied at the end of regulation. The ball can be advanced on the court by throwing it to a teammate, or by bouncing it while walking or running (dribbling). It is a violation to lift, or drag, one's pivot foot without dribbling the ball, to carry it, or to hold the ball with both hands then resume dribbling. There are many techniques for ball-handling—shooting, passing, dribbling, and rebounding. Basketball teams generally have player positions, the tallest and strongest members of a team are called a center or power forward, while slightly shorter and more agile players are called small forward, and the shortest players or those who possess the best ball handling skills are called a point guard or shooting guard. The point guard directs the on court action of the team, implementing the coach's game plan, and managing the execution of offensive and defensive plays (player positioning). The FIBA Women's Basketball World Cup features the top national women's basketball teams from continental championships. The main North American league is the WNBA, whereas the EuroLeague Women has been dominated by teams from the Russian Women's Basketball Premier League. 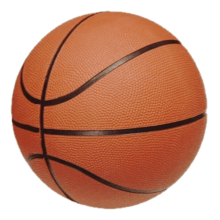 In women's basketball the ball used is smaller than that used in men's basketball. The circumference of the ball for women is 28 1/2 to 29 inches. The basketball in the men's game is between 29 1/2 and 30 inches. In early December 1891, Canadian Dr. James Naismith, a physical education professor and instructor at the International Young Men's Christian Association Training School (YMCA) (today, Springfield College) in Springfield, Massachusetts was trying to keep his gym class active on a rainy day. He sought a vigorous indoor game to keep his students occupied and at proper levels of fitness during the long New England winters. After rejecting other ideas as either too rough or poorly suited to walled-in gymnasiums, he wrote the basic rules and nailed a peach basket onto a 10-foot (3.0 m) elevated track. In contrast with modern basketball nets, this peach basket retained its bottom, and balls had to be retrieved manually after each "basket" or point scored; this proved inefficient, however, so the bottom of the basket was removed, allowing the balls to be poked out with a long dowel each time. 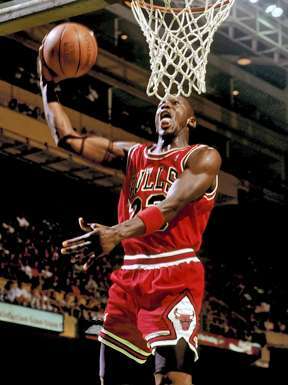 The NBA has featured many famous players, including George Mikan, the first dominating "big man"; ball-handling wizard Bob Cousy and defensive genius Bill Russell of the Boston Celtics; charismatic center Wilt Chamberlain, who originally played for the barnstorming Harlem Globetrotters; all-around stars Oscar Robertson and Jerry West; more recent big men Kareem Abdul-Jabbar, Shaquille O'Neal, Hakeem Olajuwon and Karl Malone; playmakers John Stockton, Isiah Thomas and Steve Nash; crowd-pleasing forwards Julius Erving and Charles Barkley; European stars Dirk Nowitzki, Pau Gasol and Tony Parker; more recent superstars LeBron James, Allen Iverson, Kevin Durant, and Kobe Bryant, and the three players who many credit with ushering the professional game to its highest level of popularity during the 1980s and 1990s: Larry Bird, Earvin "Magic" Johnson, and Michael Jordan. In 2001, the NBA formed a developmental league, the NBA Development League (also known as the D-League). As of the 2016–17 season, the D-League has 22 teams. 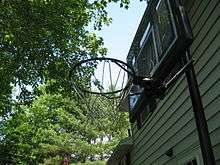 The basket is a steel rim 18 inches (46 cm) diameter with an attached net affixed to a backboard that measures 6 by 3.5 feet (1.8 by 1.1 meters) and one basket is at each end of the court. The white outlined box on the backboard is 18 inches (46 cm) high and 2 feet (61 cm) wide. At almost all levels of competition, the top of the rim is exactly 10 feet (3.0 meters) above the court and 4 feet (1.2 meters) inside the baseline. While variation is possible in the dimensions of the court and backboard, it is considered important for the basket to be of the correct height – a rim that is off by just a few inches can have an adverse effect on shooting. At the professional level, most male players are above 6 feet 3 inches (1.91 m) and most women above 5 feet 7 inches (1.70 m). Guards, for whom physical coordination and ball-handling skills are crucial, tend to be the smallest players. Almost all forwards in the top men's pro leagues are 6 feet 6 inches (1.98 m) or taller. Most centers are over 6 feet 10 inches (2.08 m) tall. According to a survey given to all NBA teams, the average height of all NBA players is just under 6 feet 7 inches (2.01 m), with the average weight being close to 222 pounds (101 kg). The tallest players ever in the NBA were Manute Bol and Gheorghe Mureșan, who were both 7 feet 7 inches (2.31 m) tall. The tallest current NBA player is Sim Bhullar, who stands at 7 feet 5 inches (2.26 m). At 7 feet 2 inches (2.18 m), Margo Dydek was the tallest player in the history of the WNBA. ↑ "The Surge of the NBA's International Viewership and Popularity". Forbes.com. June 14, 2012. Retrieved June 14, 2012. ↑ "REVEALED: The world's best paid teams, Man City close in on Barca and Real Madrid". SportingIntelligence.com. May 1, 2012. Retrieved June 11, 2012. ↑ "The Greatest Canadian Invention". CBC News. Archived from the original on December 3, 2010. 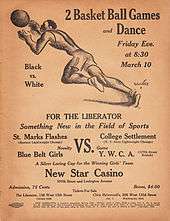 ↑ "YMCA International - World Alliance of YMCAs: Basketball : a YMCA Invention". www.ymca.int. Retrieved March 22, 2016. ↑ FAQs.org, James A. Naismith. Retrieved February 24, 2010. ↑ Inflatable ball, Inventor: Frank Dieterle, Patent: US 1660378 A (1928) The description in this patent explains problems caused by lacing on the cover of basketballs. ↑ "James Naismith Biography". February 14, 2007. Archived from the original on February 5, 2007. Retrieved February 14, 2007. ↑ Thinkquest, Basketball. Retrieved January 20, 2009. ↑ "Newly found documents shed light on basketball's birth". ESPN. Associated Press. November 13, 2006. Retrieved January 11, 2007. ↑ Fuoco, Linda (April 15, 2010). "Grandson of basketball's inventor brings game's exhibit to Geneva College". Postgazette.com. Retrieved June 3, 2011. ↑ "Hamline University Athletics: Hutton Arena". Hamline.edu. January 4, 1937. Archived from the original on May 28, 2010. Retrieved July 25, 2010. 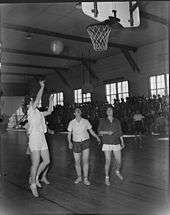 ↑ "1st Ever Public Basketball Game Played". Rare & Early Newspapers. March 12, 1892. Retrieved March 22, 2016. ↑ Queen's Journal, vol. 31, no. 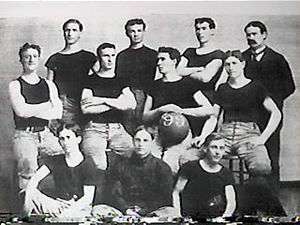 7, February 16, 1904; 105 years of Canadian university basketball, by Earl Zukerman, "broken link". Retrieved February 6, 2009. ↑ "National Interscholastic Basketball Tournament – hoopedeia.nba.com – Retrieved September 13, 2009". Hoopedia.nba.com. Archived from the original on August 10, 2010. Retrieved July 25, 2010. ↑ "National Catholic Interscholastic Basketball Tournament, 1924–1941 – hoopedia.nba.com – Retrieved September 13, 2009". Hoopedia.nba.com. December 7, 1941. Archived from the original on August 10, 2010. Retrieved July 25, 2010. ↑ "National Catholic Invitations Basketball Tournament – hoopedia.nba.com – Retrieved September 13, 2009". Hoopedia.nba.com. Archived from the original on August 10, 2010. Retrieved July 25, 2010. ↑ "– National Interscholastic Basketball Tournament for Black High Schools, 1929–1942 – Retrieved September 13, 2009". Hoopedia.nba.com. Archived from the original on August 10, 2010. Retrieved July 25, 2010. 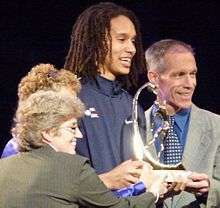 ↑ "National Invitational Interscholastic Basketball Tournament – hoopedia.nba.com – Retrieved September 13, 2009". Hoopedia.nba.com. Archived from the original on August 10, 2010. Retrieved July 25, 2010. ↑ Golden, Daniel (23 July 2012). "Three Seconds at 1972 Olympics Haunt U.S. Basketball". Bloomberg Business Week. Retrieved 18 November 2014. ↑ "Pioneers in Physical Education". pp. 661–662. Archived from the original on June 20, 2009. Retrieved June 3, 2009. 1 2 "Senda Berenson Papers". Retrieved June 3, 2009. ↑ Jenkins, Sally. "History of Women's Basketball". WNBA.com. Retrieved January 21, 2014. ↑ Peacock-Broyles, Trinity. "You Come in as a Squirrel and Leave as an Owl". Smith.edu. Archived from the original on June 15, 2011. Retrieved June 3, 2011. 1 2 3 4 "Historical Timeline". Archived from the original on June 21, 2009. Retrieved June 2, 2009. ↑ "The Great Teams". Archived from the original on August 12, 2010. Retrieved June 2, 2009. ↑ Television New Zealand, BASKETBALL | NBA getting through tough times Archived March 18, 2015, at the Wayback Machine. 1 2 3 2009–2011 Men's & Women's Basketball Rules Rule 5, Section 6, Article 1. Retrieved July 26, 2010. ↑ "NCAA panel approves women's basketball rules changes". ESPN.com. Associated Press. June 8, 2015. Retrieved June 9, 2015. 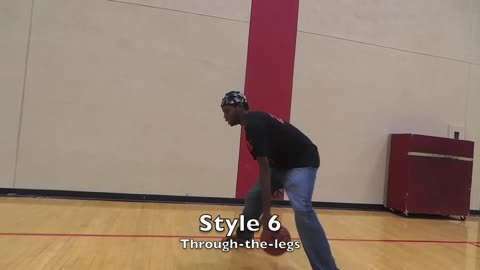 ↑ "What Are the Different Types of Basketball Court Surfaces?". LIVESTRONG. February 7, 2014. Retrieved March 22, 2016. ↑ "Wilson to provide the Official Game Ball for FIBA" (Press release). Amer Sports. June 9, 2015. Retrieved August 17, 2015. ↑ "Muggsy Bogues Bio". NBA.com. Archived from the original on July 17, 2010. Retrieved July 25, 2010. ↑ Vecsey, George (February 15, 2012). "The Old Guard Welcomes the New Guard". The New York Times. p. B10. Archived from the original on February 22, 2012. ↑ "Study: 2011 NBA Racial and Gender Report Card". SlamOnline.com. Source Interlink Magazines. June 16, 2011. Archived from the original on February 22, 2012. ↑ Celzic, Mike. "Race has nothing to do with NBA's success". NBCSports.com. Archived from the original on February 22, 2012. ↑ Kuhn, David Paul (2007). The Neglected Voter: White Men and the Democratic Dilemma. Macmillan. p. 205. ISBN 9781403982742. Retrieved February 16, 2014. ↑ "2011 3x3 Youth World Championship | FIBA.COM". Rimini2011.fiba.com. September 11, 2011. Retrieved November 22, 2012. ↑ "3-on-3 basketball might become big time?". ESPN. Retrieved January 11, 2011. ↑ Eric Shanburn (2008). Basketball and Baseball Games: For the Driveway, Field Or the Alleyway. AuthorHouse. ISBN 978-1-4343-8912-1. Retrieved June 29, 2010. 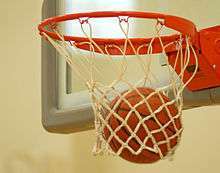 ↑ "Learn Basketball on FindSportsNow". Findsportsnow.com. November 5, 2007. Retrieved July 25, 2010. ↑ IWBF. "IWBF website". Iwbf.org. Retrieved July 25, 2010. ↑ "World Beach Basketball site". Beachbasketball.com. May 5, 1995. Archived from the original on August 9, 2010. Retrieved July 25, 2010. ↑ "Bankshot basketball website". Bankshot.com. Retrieved July 25, 2010.